Lysine, Methionine, Alanine, Glycine, Cystine, Proline and Tyrosine, Zinc, Copper, Cobalt, Vitamin C, Choline, Biotin and other B Vitamins. 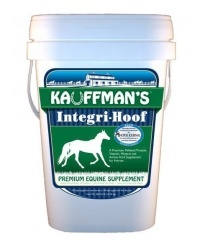 In addition to the traditional proven ingredients found in most hoof supplements one goal in formulating Kauffman's Integri-Hoof was to balance micro-minerals, and especially copper and zinc, by fostering minimal interference from iron and manganese. Therefore, Kauffman's Integri-Hoof has no supplemental iron or manganese to allow for superior zinc and copper ratios. Both minerals are deficient in most hays found across the United States. The ideal ratio of copper and zinc should fall between 1:3 to 1:5, and "Nutrient Requirements of Horses, 6th Edition, 2007" lists the daily requirements of 100 mg copper and 400 mg of zinc (a ratio of 1:4) for a 1,100 pound horse. Kauffman's Integri-Hoof has this very same ratio and amounts of copper and zinc while supplying them as proteinated micro-minerals to improve bioavailabilty and utilization. Yeast cultures have been scientifically shown to support enhanced digestion and digestive efficiency, particularly the digestibility of important macro- and micro-minerals (Ca, P, Cu, Zn and Mg), which are integral to healty bones and hooves. Methionine and Cystine are the two sulfur-containing proteinogenic essential amino acids. As such, they contribute sulfur for crosslinking of other proteins, especially those needed for optimal hoof growth. Clycine (Gly) is the smallest of the 20 amino acids commonly found in proteins. Due to its unique non-chiral structure, it makes up approximately 35 % of collagen, the most abundant protein in mammals. Collagen is integral to the structural integrity, growth and development of bones, joints and hooves. Adult Horses - feed at the rate of 2 scoops (3 ounces) per head per day. Ideally, top-dress 1 scoop each of Integri-Hoof over the morning and evening feed. Daily dosage may be safely doubled. Soybean Meal, Yeast Culture, Corn Distillers Grains, Alfalfa Meal, dl-Methionine, Zinc Proteinate, Dried Molasses, Glycine, Soy Protein Concentrate, I-Lysine, Ascorbic Acid, Corn Oil, Lecithin, d-Biotin, Cobalt Proteinate, Ethylenediamine Dihydriodide.